Does anyone remember the song "Eve of Destruction" by Barry McGuire? I'm feeling a little like that song as my house feels like it's been turned into a grotty bed sit and worse to come tomorrow! I'm probably over exaggerating :) but we are having an extension which starts tomorrow and they are going to pull my utility room down to do it which houses my washing machine, tumble dryer and fridge freezer. The dish washer I can live without, well I have two men in the house, but the washing machine is vital so that has been plumbed in where the dishwasher was and the fridge freezer stands proud in the middle of the kitchen! The dryer and dish washer are sitting on a board on top of the bath! Good job we're not short of bathroom facilities:) Roll on November. Anyway I digress and here is my card for the LIM challenge this week which is Love and Marriage. I couldn't get a decent photo to show the colour which was Spun Sugar would you believe! I think the close up shows it better. Sizzex hearts stamped with an old CS freebie, so old it's rubber with foam back! Sentiment is a bespoke stamp made for my son's wedding. As long as you've still got your crafting space!! Joking apart, Val...I hate it when the house is disrupted, but I'm sure it will all be worth while in the end. I'm still waiting to get my craft room refurbished. I've had the new desks stored for two years!! It's the thoughts of sorting many years of buried stash that's so daunting. Your LIM card is really lovely. Hearts are always a winner with me. I love the delicate spun sugar distressing and dots strip! You have my sympathy but I`m sure it`ll be worth it in the end. Your card is far from ordinary. Love the delicate colours. Val there's nothing wrong with your card it's lovely....don't envy you all the mess and disruption in your house through. Think you should lock yourself in your cubbyhole and let them get on with it! Sure it will be worth it in the end. 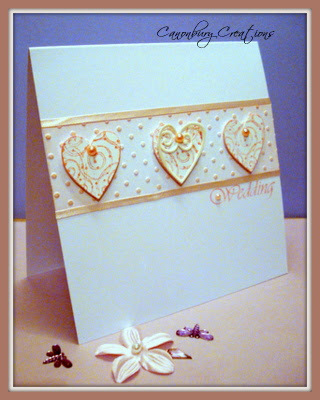 Pretty card - delicate hearts are always a winner. I think your card is just lovely Valerie, there's nothing wrong with it! Good luck in your home! Hola Valerie, thank you for your kind comment and for to read my post:D.
Ooooooh my friend TO REFURBISH IS STRESSFUUUUUUUUULLLL, all is in a mess, you think only to escape from your home:D:D, cheer up my friend. gorgeous card, i love pink colour, i love polka dots embossing, well done Valerie . Valerie, I do feel for you having construction going on. I can't stand to have people working around my house, mostly because I always think I need to supervise them! LOL! The mess they make is probably the worse part....here's hoping they get through ahead of schedule! Love the sweet card..that's always a great layout design!! It's funny how the pink photographed so differently, isn't it? your card is so pretty and not ordinary at all!! 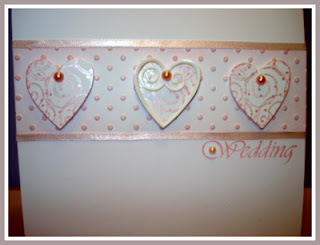 love the punched hearts with the little pearls! i hope that the contruction of your extension goes quickly and with little stress to you!! Such a warm card that it is done in spun sugar... which makes it sweet. Lovely hearts and ribbon. This works beautifully Valerie, very elegant in its composition. That is just fabulous, Val! I love it!